The past several weeks have been especially busy at my work, partly because of the latest reorganization of our editorial staff. Still, I’ve managed to get out to lunch a few times while the weather was nice. I finally got to Solea on Waltham’s Moody Street. It has been a long time since I’ve been to Dali in Somerville, but my co-workers and I liked Solea’s tapas just fine. The Local is a decent American bistro near Blue Ribbon Barbecue in Newton, Mass. On Saturday, 27 July 2013, Janice and I drove out to the Lowell Folk Festival, which we chose over the Boston Arts Weekend since we had gone into town recently with Damon F.P. and Carlo R. We liked both the postindustrial, art-friendly city of Lowell (which is similar to Waltham but larger) and the festival itself. There were a lot of great musicians, as well as crafts vendors, family activities, and, of course, food. I was pleased to try a wide range of ethnic cuisines, including Greek, Polish, and even Filipino! It might not be my mother’s cooking, but it’s as close as I’ve found in New England. Janice and I also explored the New England Quilt Museum, which happened to have an exhibit of items from the past 200 years from eastern Pennsylvania, which is where Janice’s family lives. In addition, we stopped by at Larry’s Comics. There were enough other restaurants and galleries that I’d be curious to visit Lowell even without the festival. This past weekend, I got to see some college friends. Stuart C.G. visited Boston on his way back to New York from business travel in Singapore. We enjoyed the Boston Comic Con. I wasn’t able to dine with him, Thomas K.Y. & Kai-Yin H. on that Friday or Sunday. 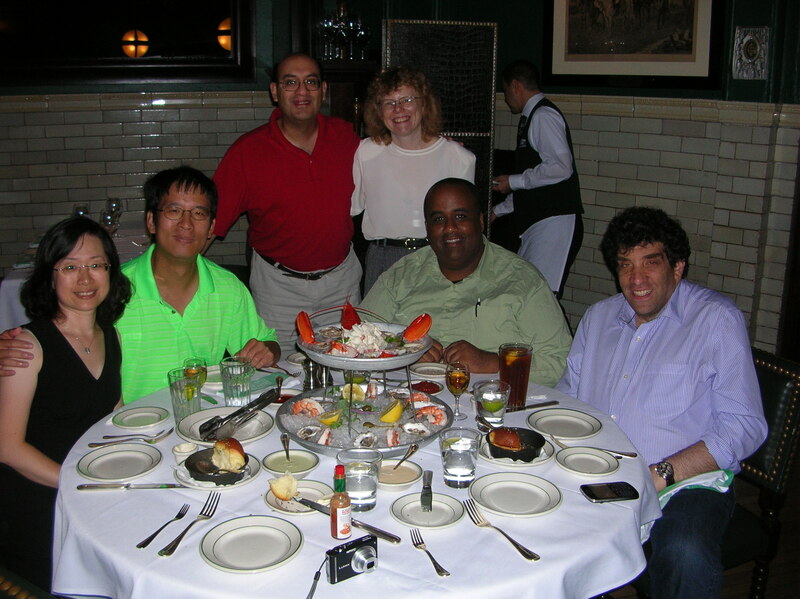 However, Beruk, Janice, and I did join them for dinner at Smith & Wollensky on Saturday, Aug. 3, near Stuart’s hotel downtown. The food and service at the steakhouse were superb, as I recalled from one of Stuart’s previous visits. I enjoyed the shellfish bouquet we ordered as an appetizer, and the roast rack of lamb was good (if a bit challenging to cut apart). On Sunday, Aug. 4, I visited yet another SUNY-Binghamton alumnus, Ron J.K., at his brother’s home in Brookline, Mass. As always, the family was very hospitable, and Ron’s niece Anna showed off her pet iguanas and knitting skills. On Tuesday, Aug. 6, David I.S. stopped by on his way home to Upstate New York after his travels, which included a cruise to Bermuda, meeting friends in Manhattan, and hiking in New Hampshire. Unfortunately, he had picked up a respiratory infection in the process, but we managed to grab a bite to eat at City Streets, one of Janice’s and my go-to restaurants nearby. In the coming weekends, Janice and I will be traveling to Virginia for my parents’ birthdays and to Pennsylvania for a wedding of a cousin of hers. We’ll need another vacation by the time summer’s done! Posted on August 8, 2013 by GeneD5Posted in Food, Miscellany, TravelTagged David I.S., restaurant, visit.